An anti-reflection coating on your lenses cuts the amount of light that bounces off the front surface of your glasses. It can help you see more clearly compared to uncoated lenses. A British standard is an agreed way of doing something. For sunglasses, it ensures that sunglasses are made to a standard that will provide an agreed degree of protection for your eyes. A CE mark is a symbol applied to products to indicate that they conform with relevant EU directives regarding health and safety or environmental protection. Check that your sunglasses carry the CE mark, and beware of buying sunglasses on holiday where regulations may be less stringent and marks may be faked. A mirror coating on polarised lenses will counteract the increased UV being reflected from the water if you are out all day. Photochromic lenses darken in sunlight. They are great if you are light sensitive and if you prefer lenses that darken automatically to having to put sunglasses on and off. People with conditions such as albinism find photochromic lenses essential. If you use photochromic lenses for night time driving, request an anti-reflection coating to render the pale comfort tint in the un-reacted lenses virtually clear. 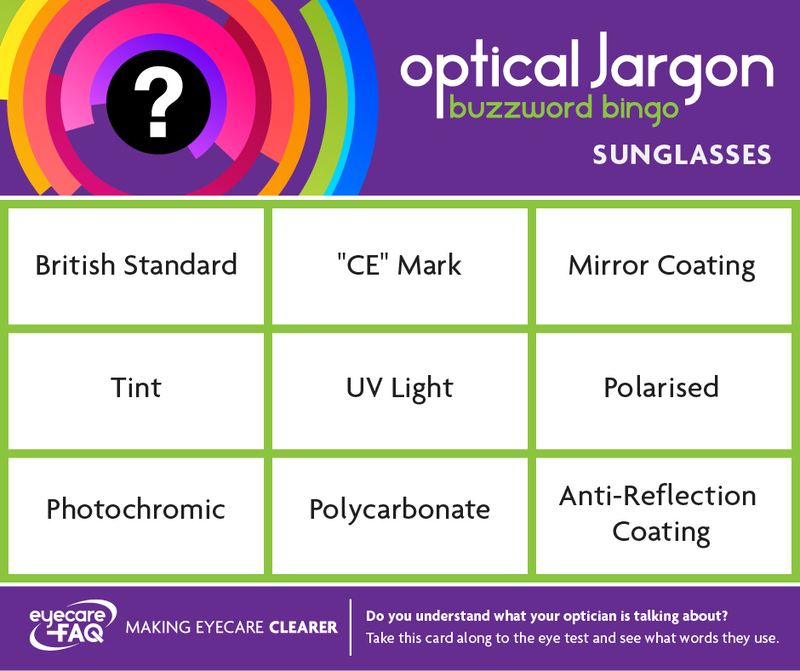 Speak to a registered dispensing optician to find out if this type of sunglass lens will suit you. Polarised lenses cut glare for use on and around water and other reflective surfaces. Polycarbonate is a tough material with good UV protection that is used in making some sunglass lenses. It is great if you enjoy sport and want a robust pair of sunglasses that offers some protection too. You can get lenses made to your prescription to fit some sunglass frames. Ask your registered dispensing optician for advice. A tint on your spectacle lenses cuts the amount of light reaching your eyes. Tints are available in many colours and different densities. Try on different tinted lenses to see which suits you and ask a registered dispensing optician for advice. Trivex is a tough material with good UV protection that is used in making some sunglass lenses. It is great if you enjoy sport and want a robust pair of sunglasses that offers some protection too. UV (Ultraviolet) rays come from sunlight. There are three types: UVA, UVB and UVC. UVC is absorbed by the ozone layer and does not reach the earth, but the other types of UV light are linked to possible cataract formation, skin cancer and/or retinal damage with long term exposure.